A presentation of outstanding wearable technology projects from the School of Design at Victoria University of Wellington, New Zealand. 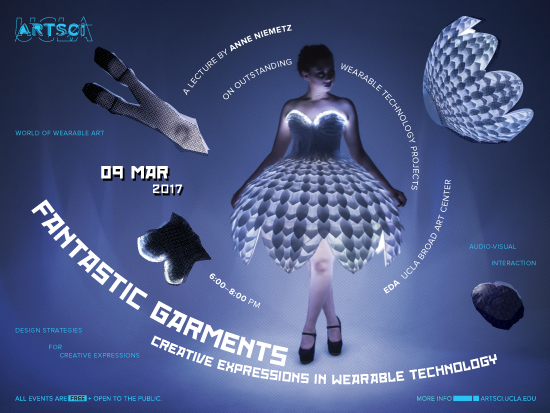 From prototype to final design, Anne Niemetz will be discussing design strategies for creative expressions with wearable technology while presenting projects that have been created by her students, including World of Wearable Art finalist garments. Anne holds a Media Arts degree from the Staatliche Hochschule für Gestaltung Karlsruhe (HfG), Germany, with a focus in digital media and interactive sound installation. She continued her studies at the University of California Los Angeles (UCLA) where she received an MFA in Design and Media Arts in 2004. In 2007 she moved to New Zealand, where she holds the position of Senior Lecturer in the Media Design programme at Victoria University of Wellington.